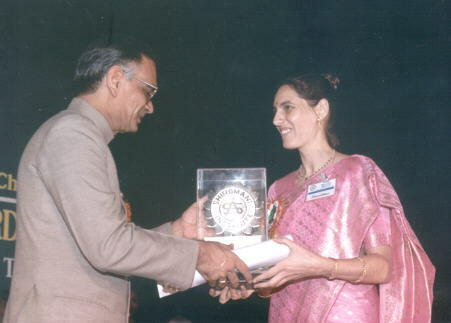 the Mahila Shiromani Award from the hands of the then honourable Speaker of Lok Sabha, Shri Shivraj Patil. and the General Secretary of Omkarananda Ashram Himalayas. She has studied Bharatanatyam and Odissi from prominent Gurus, like Dr. Yamini Krishnamurti, Dr. Minati Mishra and other renowned personalities. She also got intensive training in North-Indian Kathak dance under various dance Gurus from Jaipur, Mathura, Calcutta, Lucknow, Benares, etc. and earned a Prabhakar title for Kathak dance from Prayag Sangit Samiti, Allahabad. Presently she gets training in Bharatanatyam Temple-Dances by the great Bharatanatyam Guru Shri Deepak Mazumdar, Mumbai. Kumari Somashekhari has specialized in the devotional aspect of Indian classical dance. 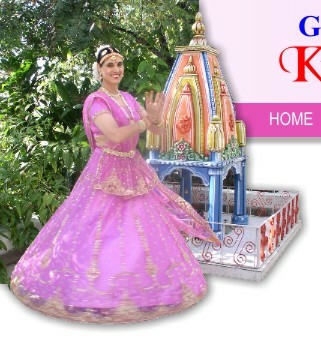 Her aim is to revive the ancient temple-style and propagate dance as Sadhana, as a way to God-experience. Her dance is a pure dedication to her beloved Sadgurudev Shri Paramahamsa Omkarananda Saraswati. Kumari Somashekhari has performed before distinguished gatherings in India and abroad and has been applauded by art lovers and critics for her authentic depiction of moods, for her grace and flawless presentations of various dance forms. One of her memorable performances was during an India-NRI World Convention when she won spontaneous applause. Her dance has several times been broadcasted in various TV-Channels in India and abroad. 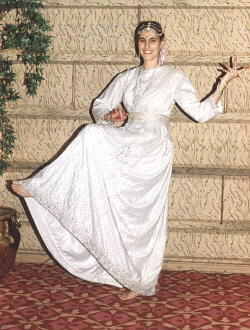 Somashekhari's dance performances have been shown in Indian and Foreign Documentary-Films. The efforts in her cultural field earned her the prestigious Mahila Shiromani Award. Later on she also received other Awards, like Natya Ratna Award, Rashtra Shakti Award, etc. Besides dance, Kumari Somashekhari has a great love for the Indian classical music. She received training in Karnatic vocal music, playing the Tambura and the Veena and she also studied Hindustani vocal music. The honour Kumari Somashekhari appreciated most was, when Gurudev Paramahamsa Omkarananda Saraswati gave her the title Kalanidhi.